Playing Manchester United at home is one of the benchmark matches of the season. It’s a guide to how we rate at the top end of the market, more accurate than playing Ars**al or Ch**sea because it’s intensely competitive without the frantic mayhem of a derby. Spurs came out of it rather well. Not a classic by any means – our flowing passing game was totally absent in the first half, but this is Man U, nobody gets going against them. Instead, we found a few workarounds to problems that in the past would have seemed unfathomable. We’ve played better but the point is, we kept playing and eventually were rewarded. Keep that up and we’ll be rewarded at the end of the season too. We deserved this point, but then again when was football ever fair? It’s not about a points victory. Fate turns on those few precious moments when opportunities appear. United took full advantage, as they do. One down to a superb header, a reminder if any were needed of the value of a top quality striker as focal point and finisher. YES I KNOW he used to play for Them, and that we could have marked better. However, the accuracy of the cross, two stabbing steps backwards and the power of a header, falling backwards, just inside the post. There must be one like that out there, somewhere. Soon come, or else this promise could go to waste. In the past we would have genuflected to the dominance of our superiors. Instead, we gradually cranked it up and put United on the back foot. 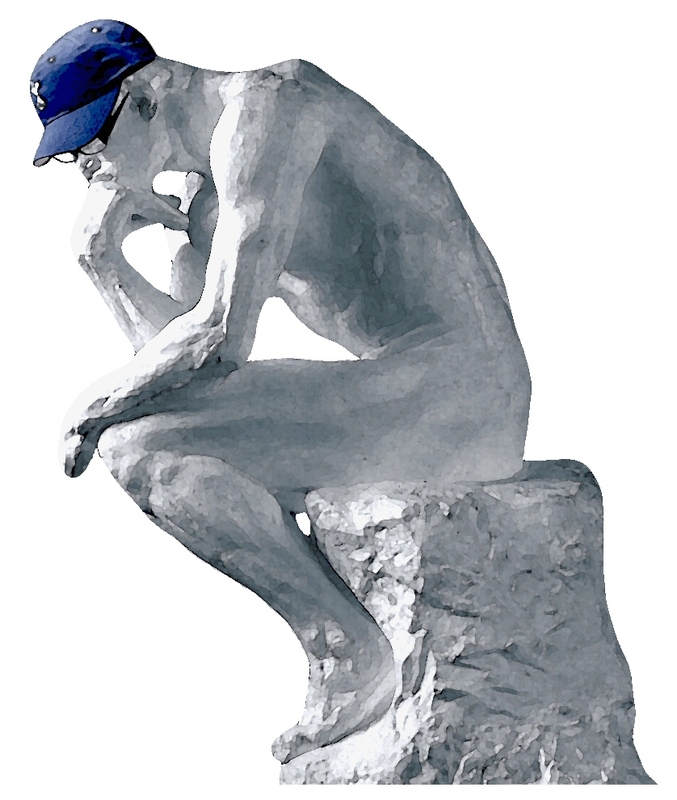 We created two golden chances and missed them, two fatal self-inflicted blows or so it seemed. On the Shelf, it was obvious – we were never going to score. Then Lennon pounced on a loose ball. His quick cross sped across the box and Dempsey popped up on the end of it. He’d had a mare of a match and if I had had my way would have been substituted long before his moment of glory, but like the determined pro he is, he somehow put behind him his ghastly miss at the start of the half to keep his head when this second chance presented itself. USA! USA!s story summed up our afternoon. We put the stuttering first half behind us, 45 minutes that put our limitations on public display. Plenty of possession but little punch when it mattered, our efforts petering out as we neared the United box. Bale, two men on him, wriggled and writhed but could not break free. Wandering inside, no one could give him the ball and like the rest of them he was swallowed up by United’s massed ranks. Parker toiled in vain, driving on from the midfield, utterly focused on lifting spirits and leading by example. such a fierce glint in his eye when he goes in for a tackle. He ran and ran but he needs someone to pass to when he gets upfield and too often we stood and watched him toil. Parker as the most advanced man is wrong – if only Dembele had taken up those positions instead. I missed Sandro, but then I always do. Out for the season, anyone but him. United play as if they have something in reserve. Even when they defend, it appears as if this is how they want it to be, before they break free. It took me a while to realise how much of the play was in their half. Searching for a way round, we realised, or our manager realised, that if there are two men on Bale then there must be space elsewhere. As the match wore on, Lennon came into it more and more. In this his best season for Spurs, he’s getting better and better. His turn to leave Evra tackling thin air then find Defoe in the heart of the box was dazzling. But Defoe took a touch and the moment was gone. No matter. Azza kept buzzing away at the United defence like a wasp around a jampot. He’s finally realised that the ball can be his friend. He nurtures it now, caressing and persuading it to do his bidding rather than letting it tame him. The way he holds out both arms when he passes always looks like an involuntary movement caused by a medium-voltage electric charge running through his body. However he does it, he’s mastered a way to stand the ball up at the far post or pass the ball low into the box. His greatest strength undermined all his efforts in the past. How is it physically possible to cross or pass accurately when you run at the speed of sound? He has to slow the legs down to normal speed before doing anything else. Now, he understands his body. Once that is under control, so is the ball. There was a lot of AVB love around in the papers this past week with both the Independent and Guardian offering positive pieces that covered what the fans already know, that in Villas-Boas we have a shrewd, hard-working leader who has won over the players and is able to get the very best from them. He’s totally dedicated to the club. I suggested before the season began that he is not only desperate to prove himself, the only way he can do so is through his team. He is not interested in personal glory or in pi**ing contests with other managers. Rather, his vindication comes by his team playing good football and being successful. Our team. The previous incumbent of the post has a reputation for looking after players but just ask Bent, Pav, Gomes or Bentley, literally frozen out in the middle of Russia, what happened if he thought you did not fit in. Now, I can’t recall a time when so many good news stories are emerging from the club. When AVB was appointed, the media were determined that he was the story. Now, it’s his team. Dawson says he was given a chance even though he could have left, and the boss has realised what he can do. Dempsey has had an inconsistent start, to put it politely, yet is burning to play. This manager lavishes time, care and attention on his charges and they are responding. That’s proper man-management. Being this open is not easy. He could hide away in his office, instead he’s highly visible on the training pitch and in the dressing room. Many leaders retain their authority by remaining aloof. There’s no debate, their word is gospel. Villas-Boas chooses the more difficult option, but by staying open and accessible he places faith in his methods and in the players’ abilities to put them into practice. In return, he inspires loyalty and comittment. This leadership is one that sets targets and a vision that is for the good of everyone, that empowers players who discover in themselves their true ability and retain it, as opposed to relying on someone else to motivate. It’s a feeling that lasts and it can do nothing but good for the club. Not AVB as an individual, but to the club. In contrast, the media coverage yesterday has all been about one individual as Fergie exerts his customary influence on the football news agenda. It was all about him, telling tales on a linesman who denied a penalty appeal. It obscured the suggestion that he may have been at fault. United frequently use the ploy of bringing on attacking players later in the match to defend by taking the game to their opponents. By the end, Welbeck, Rooney, Valencia and Van Persie were all on display. If he had done his homework, he would know Spurs don’t like being restricted. These substitutions opened up the space just at the moment we were upping our pressure. It was a mistake. unless absolutely necessary was less of a public service announcement and more a direct and personal instruction for me. But I had decided so was compelled to go, albeit with a workaround of my own to drive 50 miles on main roads only. Hearing that the game could be called off reminded me of the futility of it all. All that way, for nothing. These days there is no way of taking an educated guess as to the state of the ground. In the old days it was about frozen pitches, shovelling snow and orange balls but now it’s all technology, undersoil heating and part grass part plastic pitches. So on we drove, without frankly a second thought. I969 or 1970, my mum had promised to take me to Spurs versus Leeds. It snowed. I rang the Supporters Club. At 1pm it was on, the only match in London to take place. I suspect my dear old mum was hoping it would be called off, but she had promised and I was determined, so eventually by bus, tube and bus again, in the freezing cold, we made it. 40 plus years on, I’m still the same, the boy’s heart still beats faster when it comes to being there, with this as with nothing else I am determined. It would have been enough just to see the game, but Clint, my man, a special thanks for being there too. @”caressing and persuading” Yes, by gad. But also flying back to do some essential ball pickpocketing – more than once. Great commitment! Yep, he’s upped his game in defence too. Must say – I didn’t think he could contribute so much all round. Hi Alan, great article, you’ve pretty much stolen my thunder with regards to Sunday’s match. I’d just however like to pick up on your praise of the manager and the positive effects he’s had on Michael Dawson. Don’t tell my Missus but I love Daws. I’m at least two decades his senior and yet I imagine holding his hand in a crowd and looking trustingly up at him like a favourite uncle because I know that h’ed look after me. It would be viciously unfair to describe him as a throwback to the safe and sensible seventies because he is in every way a modern athlete. Yet I can’t help thinking that if there were to appear a hole in the time space continuum, he more than anyone could take a trip on the flip side and fit so easily into the old number 5 or 6 shirt. With regards to the weather, I can tell you that the temperature here in sunny Stockholm is currently minus 15 degrees so I would suggest that everybody back in blighty should stop whining and enjoy the heatwave. Bit weird…but this is TOMM, the blog where it’s OK to come out of the cupboard ( is that right?) and say, Spurs? Me, I love them with all my heart and soul…. Save a bit of Daws for me, huh? Not the greatest but I never want to see him leave. Yes he has us playing as a team. 4 points against Man U in the two games. How good is that. We need a world class striker and a ball playing mid fielder. Thanks, and you are right, that striker will do me. I’m reminded of how Mingus described his gifts – composing music was a gift, being one of the greatest bass players was down to hard work. For Lennon, being able to go round people is a gift he’s always had. But now, the hard work put in, the hours on the training field (and the advice he’s clearly been taking) are all paying dividends in his game – best of all to see, chasing down (and getting back) every ball he loses. He works like a Trojan and mixing that with everything else should make this a great season for him. Man, Lennon and Mingus – this comments section is like no other Spurs blog. Cool. As I haven’t been well recently and the local area like a skating rink, I was tempted to stay at home but decided to make the journey in. I’m so glad I did. We played well and deserved a point. The image of the lads celebrating in front of the Paxton in the snow will stay with me for a very long time. I’m pleased for Dempsey too. He’s worked hard and deserved his moment of Spurs glory. The only disappointment for me was Dembele who managed to keep his kit in pristine condition throughout. Apart from a couple of nice turns somewhere in the 2nd half, I barely noticed him. It was out of character. I’m struck by the way in which we’re going about our business these days. I thought I’d miss ‘Arry’s press conferences but I like the way we’re going about our football with quiet dignity. I like the way AVB deals with the media. Contrast with Fergie, who really wants to have a shot at greatness with this final team, scrapping the barrel for excuses. No longer able to automatically raid Spurs (or equivalent) each year for the player who will move them on, he must be coming to realise that this lot aren’t going to be anywhere near the Scholes/ Giggs etc of United folklore? Their forward line is formidable but defensively I’m not sure I’d swop anyone for our guys. Carrack looked a shadow of the player we sold and I’m sure Fergie now counts his fingers after he shakes hands with Daniel Levy. Thanks Peter, good to hear from you. Once again Alan, a great read. Brilliant game. proud of AVB, the players., and us fans for making it a great atmosphere. Lovely sentiments. The draw was fantastic, especially coming when it did, and 4 points from them is great, AVB needs backing. Over to the tight one. Now is the time to spend big on the right striker. If they exist – just a north London myth, I reckon…..
Lennon was quick and accurate in making that wonderful pass to Dempsey who scored but let us also give credit to BAE who started the move in the first place with a great cross into the goal mouth of United. Such crosses had been few and far between before he came in. I would like to see BAE take back his left position in the defence at the start of every game. He always makes a great impact in every game as an attacking defender. The real credit needs to be given their keeper. I thought Benny was all over the shop when he came on. Still needs time of course, having just come back. As ever an atmospheric and astute write up on the game and wider Spurs affairs, Alan. Thanks. 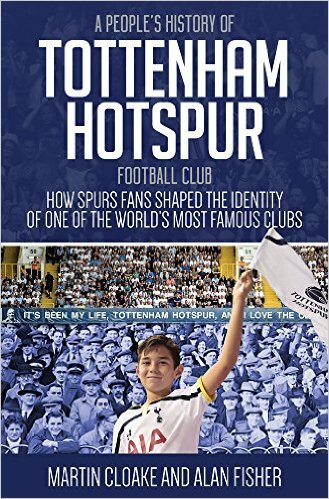 I especially enjoyed the AVB part and your trip to a snowy WHL to see Leeds in 69/70. I know a few non-Spurs fans who are pleased for AVB, if not Spurs, after the gratuitous kicking he’s been given in the press on taking over at the Lane. Aside from how we are growing as a side, with still much room for improvement – we should really have won on Sunday – André seems a very decent fella who as you rightly say “gets Spurs”, like Jol did. That may be trite but it matters I think. Think it does matter, you are right. Think there was more frustration in the air – different in hindsight now we know we have won. Another great blog which I was looking forward to reading after what i thought was a really great game at the Lane. I particularly liked your last paragraph which is so true. I remember being so dissapointed as an 11/12 year old when a THFC/Liverpool game at the Lane was postponed due to the freezing conditions many years ago. I could’nt help thinking as I was watching the game on Sunday from the stands that this really was a taste of the good old days. 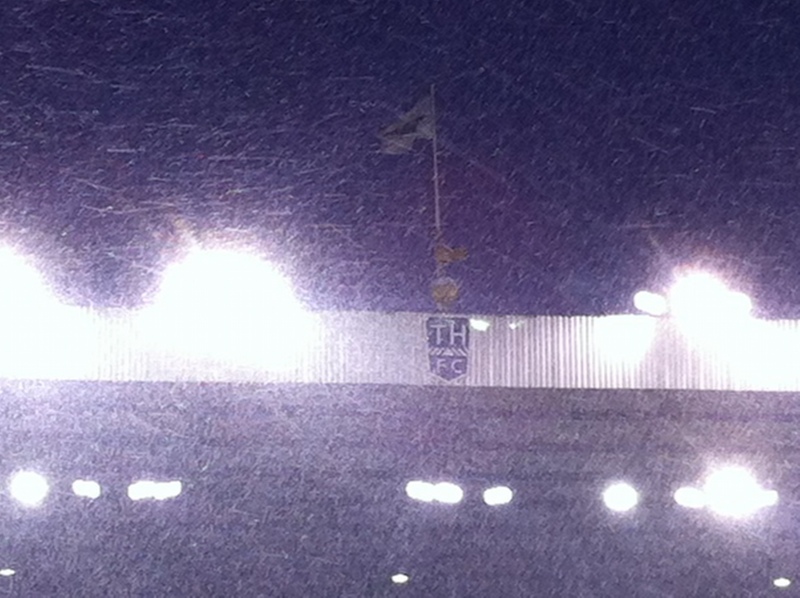 Freezing cold, snowing, great game, great atmosphere and Spurs giving United a right good old game. Tottenham and Manchester United are two great footballing teams. They both play open, flowing football and for this reason, their matches are always entertaining quite unlike those teams that play purely defensive football in a ‘park the bus’ style. That’s what this blog wants – Spurs against the best and giving it a right good old game. Perfect. Another great writeup, Alan. In particular I could not agree more about 3 things; #1 Lennon is having the season of his career, #2 Sandro was my player of the season to date and (as good a job as Scottie Parker will do) I think his absence could make a big difference come season end, #3 much as I like Defoe we lack a true difference making striker (RVP being a prime example). Thanks, and yes, yes and yes. Given the general fair minded approach of your blog, which I’ve followed for the last few years, I’m again struck by the tone you use in relation to Harry Redknapp . You won’t even refer to him by name, merely referring to him as, ‘The previous incumbent of the post’. For what he did for our club, I believe he deserves more respect than that. You obviously don’t and you’re entitled to that view but it seems that in each of your posts you cannot resist the opportunity to take a swipe at him. I get the point that you’re not a fan but maybe you should let it go. Otherwise, cheers for the excellent blog which I look forward to every week. Bit snide, maybe. But if you have a look back, and I know you are a regular, I’ve praised him for some of the best football in the last thirty years, the CL quarters was remarkable and many times I’ve written that as far as I’m concerned, he can tell us as often as he wants that we had two points from eight games because we were in deep. The point I’m making here is that if Harry were still in charge, this would all be about him, whereas with Villas-Boas, it’s the team. And I do prefer it that way. I think everyone knows that Harry is a bit of pr operator but I never held it against him. It was always part of the package of what you got with Harry, a guy who who did great things while at Spurs. I’ve been supporting the club since the late ’80s and his spell in charge was far and away the most enjoyable and successful period during that time. Harry does not deserve the credit for all of this (despite what he may have you believe!) . Levy runs a very tight and effective ship and Jol had brought us up a level prior to Harry’s arrival. However I believe Harry did make his very talented squad tick and we played fantastic football and had great times under him. For me the run in of the 2010 season culminating in that fantastic night in Eastlands as well as the glorious performance against Inter at the Lane stand out . Since his departure there has been a lot of po-faced and almost puritanical commentary from Spurs fans about Harry. You get the sense from some that he wasn’t really good enough for us. This is despite the fact that we played arguably the best football in the league under him – and in doing so carried on a tradition which the club prides itself on and for which we’re respected. It is almost like in their efforts to convince themselves of the merits of AVB, people feel they have to denigrate the approach and achievements of Redknapp. Personally I think that’s regrettable and unnecessary. They are different managers with different characteristics and approaches. Harry is gone and good luck to him. AVB will be judged on his achievements, the same should apply to Redknapp.